Hollywood legend Barbara Stanwyck saddled up with writer-director Samuel Fuller for the pulp maestro's most audacious western, a boldly feminist spin on the genre that pivots effortlessly between ribald humor, visceral action, and disarming tenderness. High-riding rancher Jessica Drummond (Stanwyck) commands a forty-strong posse of cowboys, ruling Cochise County, Arizona, without challenge. When U.S. marshal Griff Bonnell (Barry Sullivan) and his brothers arrive in town with a warrant for one of her hired guns, Jessica begins to fall for the lawman even as he chips away at her authority. 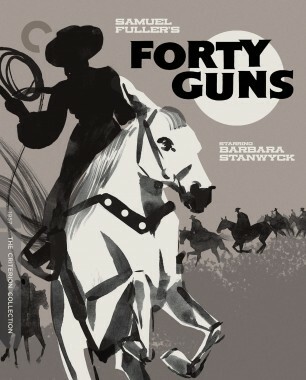 With astonishing black-and-white CinemaScope photography, hard-boiled dialogue laced with double entendres, and a fiery performance by Stanwyck at her most imperious, Forty Guns is a virtuoso display of Fuller's sharpshooting talents. Last edited by dwk on Wed Aug 15, 2018 9:43 pm, edited 1 time in total. Like maybe a proper restoration of The Big Red One? Or maybe Park Row or Verboten!. Park Row or Verboten would be nice HD upgrades. It always seemed to me, on top of that, that the available elements are in very good shape. The masters used for the DVD releases were quite good already, and I wonder why they haven't been upgraded yet (especially Park Row). Generally westerns don't do it for me, but I love these unconventional and experimental takes on the genre, much like Johnny Guitar or The Furies. The fact that it stars a favorite of mine, Barbara Stanwyck is another plus. I'm glad I never ended up getting the Eureka version considering this one has a new 4K restoration, too bad there's not much in the way of special features though. The documentary and the interview with Sara Smith should be interesting though. Excited to have more Fuller in the collection. Not necessarily. Forty Guns is new to the collection whereas White Dog is already in the collection and could easily be upgraded without new material. Dom, there is a UK blu ray of White Dog? Given your post above re focusing on a Fuller that doesn’t already have a blu ray, why not just get the UK disc? I've been anticipating Park Row for almost a decade now, back when Criterion's interest was first mentioned. We finally got Rublev, so here's hoping.